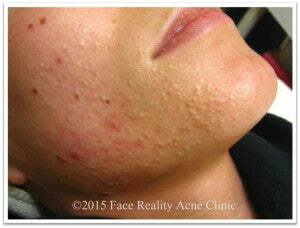 Back Home › Acne Information Center › What Are Blackheads? 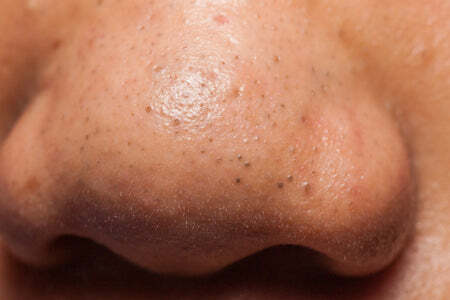 A blackhead is a non-inflamed acne lesion where the pore remains open, also known as an “open comedone”. In the case of a blackhead, the tip of the plug darkens as it is exposed to oxygen in the environment. Contrary to popular belief, blackheads are not caused by dirt – it is a plug of dead skin cells and sebum that is discolored. When the end of the “plug” gets exposed to air, it oxidizes and turns the dark color; hence giving the blackhead its apt name. You will need strong products and they will need to be used in the correct way. You will also need an acne specialist to coach you in how to use these products correctly. It is vitally important to follow instructions closely and consistently, as this type of acne can be the toughest to get under control.